Jesus Christ was a great messenger of reconciliation and social righteousness to the world, President Maithripala Sirisena stated. In his Christmas Message, he described Jesus as an eternal savior to people around the world. “Jesus Christ was born into this world in an era when immorality, chaos and cruelty was the order of the day. Since then, the new religious vision that emerged centering a humble dwelling shines eternally as a mark of human greatness,” he said in his message. Religion is one of the most precious guiding lights of the human civilization. Religion makes people show compassion and kindness to others and be empathetic towards others. Over 2,000 years ago, the Jesus Christ was born into this world in an era when immorality, chaos and cruelty was the order of the day. Since then, the new religious vision that emerged centering a humble dwelling shines eternally as a mark of human greatness. The Christmas, which is celebrated by all the Christians around the world as a universal festival, embodies loving kindness. Jesus Christ, who could reduce power-crazy kings such as Herod to a mere mention in the history was a great messenger of reconciliation and social righteousness to the world. This makes Jesus Christ an eternal savior to people around the world. I extend my warmest greetings for a wonderful Christmas to all Christians who nourish the teachings of universal love, peace, happiness and kindness. I wish for a Happy Christmas full of Peace and Joy to all Christians. Of course, My Dear Citizens, “Jesus Christ was a great messenger of reconciliation and social righteousness to the world”. Well, me, born in Pollonarwa, assumed that I was the brother to Jesus Christ; unfortunately, my assumption has been debunked and now I accept that I just another Sri Lankan Pambaya. Well HE the president, your Christmas message is welcome. But There are no ‘MAN-KIND’ because there are no ‘WOMAN-KIND’. You have to be gender sensitive and it should be human-kind. Because, when women and men get together they are KIND to each other. 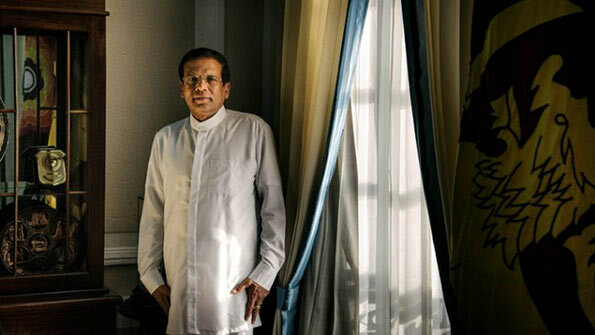 Sirisena is lurking in the shadow, ready to pounce on FCID/Bribery Commissioner/Magistrates who are doing their duties and arresting thieves and murderers and drug dealers. Sirisena is powerless to apprehend public servants and politicians who are corrupting >50% of Government tenders.